Feeling inspired to turn your backyard into a summertime haven by building your dream deck this year? Me too. Some of Victoria’s best and brightest deck experts have imparted their wisdom for me to share with you. So I’ll tell you what I’ve learned — and we can both dream. 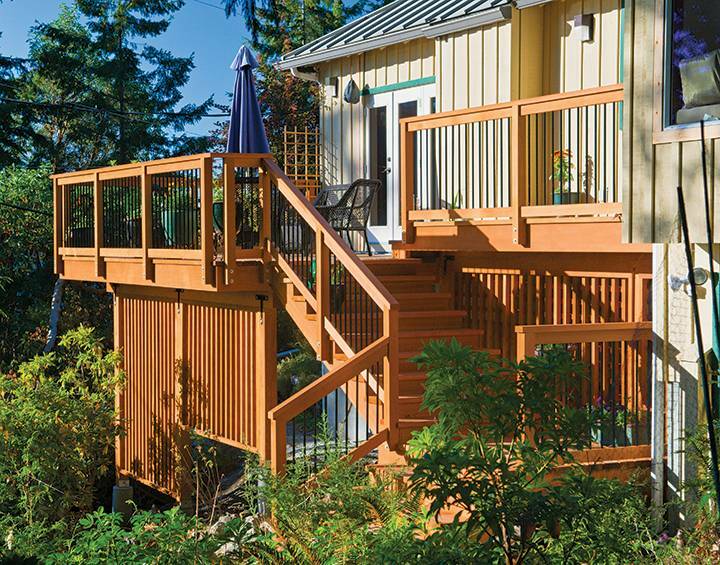 This deck by Paul Hofmann Construction uses Western Red Cedar, which was entirely pre-finished before installation. By using hidden fasteners, the walking surface has clean lines, uninterrupted by screws or bolts. The open spaces between the powder-coated aluminum posts maintains the ocean view from the deck, while the wooden posts on the lower portion act as a screen. First off, let’s take a moment to gloat about our climate, shall we? A well-designed deck is a particularly good investment here on the South Island; the outdoor living season is so gloriously long. With the right design features, such as heat lamps and shelter from wind and rain, it’s possible to enjoy outdoor living spaces all year round. There is one caveat though: as far as wood decks go, we probably couldn’t live in a harsher climate. The dampness wreaks havoc on poorly-built decks. Within a few years, this causes mould, rot, cracking, popped nails and peeling. Wood-boring insects (termites and carpenter ants) pose a problem year-round. But built correctly, a deck may very well outlast the house to which it is attached. It all comes down to the materials and the design, put together by a qualified professional. Decks employ both art and science, and professional builders and designers are well-schooled in all the complexities. Here’s what they have to say. Yes, you need to think about the colour, shape, size and texture of your deck, but first you need some big-picture planning. Elevation changes in the yard, privacy and noise, exposure to weather, municipal building requirements and your home’s architecture all impact the deck’s location and design. Even if you don’t have a south-facing backyard, Macleod’s goal is to design the deck to maximize sun exposure and provide shelter from the elements. If your yard faces north, for example, you might be able to extend the deck out into the yard, or even take advantage of an overlooked area, like the front of your house, using screens, plantings or water features to create privacy and reduce noise from the street. Think about how you’ll use your deck. Where do you think you’ll sit most of the time? Do you want a pergola or other shading structure for sun protection? Do you see yourself using the deck in the winter? If so, you might need to factor in the necessary wiring for heat lamps and lighting. Planning an outdoor kitchen? You’ll need a design that incorporates cold and hot water plumbing and possibly gas lines for the barbecue. What about the landscape; are there any established trees that you need to work around? Traffic flow in and out of the house is key too. “If possible, a deck should have a direct connection to the kitchen,” Macleod says, pointing out how adding a deck with well-placed doors can even solve traffic flow problems inside the house. He likes to add a window into the kitchen too, so people can pass food and dishes between indoor and outdoor cooking spaces. Elevation can be particularly challenging, especially on steep, waterfront properties. Macleod employs all sorts of creative tricks to bring the deck closer to the ground when necessary. “I like to get the deck down to a level of no more than six or seven steps to the ground,” he says. To do that, he might suggest a couple of risers down from the house to lower the main deck, or build a series of risers and landings to gradually transition from house to yard. Interestingly, Macleod’s background in social sciences brings another important but often-overlooked element to deck design: the psychological impact of location. A trellis built perpendicular to the house provides a nice seating nook, but you can also create that sense of security with a short wall, a screen or a hedge on one side. Plants and stunning landscape features like living walls (walls covered in artful plantings) smooth the transition from house to deck to yard, and can make even the simplest deck extraordinary. A deck is true living space, says Macleod, which needs to be approached with the same care and expertise as any interior renovation project. It’s easy to get carried away with plans for built-in features and intricate designs, but you need to ensure that, first and foremost, the deck is built to last. Paul Hofmann, owner of Paul Hofmann Construction, agrees. “You have to design so that the wood can breathe, so that water can shed without pooling anywhere.” Built-in features are problematic if water, dirt or plant debris collects around them, unless your deck is made of concrete. Also, think carefully before you commission built-in furniture that you won’t be able to reconfigure when the mood for change strikes you. That said, be creative with steps, landings and risers, which serve a practical purpose but also provide extra seating. Toss some cushions on a wide riser and voila! An instant chaise lounge. The railing deserves special consideration, too, because it has a big impact on the deck’s overall appearance. Glass railings are durable and offer unobstructed views, while decorative balusters and post caps may better match the architecture of a character home. Make sure the top rail isn’t blocking anyone’s view. What’s your sitting height compared to the railing height? Does the railing obstruct views from inside the house? Also, safety is of prime importance; so again, railings must be designed so that rot will never compromise safety. Nobody wants to pad around on pressure-treated lumber in bare feet, although that wood may be used as part of the deck’s structure. So what are the best options for the decking surface? Composite decking (made from wood fibres and recycled plastic) was once billed as bullet-proof and maintenance free. Sadly, time has proven the material a poor investment, cracking, pitting, and fading in as little as five years. New PVC products like those made by AZEK and Fiberon show promise, but they haven’t been on the market long enough to live up to their claims. Cedar remains an affordable and practical choice, although it must be meticulously maintained for a long life. Lars Nielsen of West Wind Hardwood, says clear, vertical grain Western red cedar decking should last at least 15 to 20 years if maintained properly, although Macleod suggests much longer. Concrete remains a durable and beautiful alternative for decks and built-in structures, like seating, planters, and water features, lending itself particularly well to a minimalist, contemporary look. If your yard is too small for a conventional deck as per municipal bylaws, concrete is a great solution because it is considered landscaping, and you can literally landscape right up to the property line. Nielsen says sustainably harvested hardwoods like teak, Balau Batu and Garapa are extremely durable options that age to a silvery patina, requiring no sealers or oils unless you want to keep the original wood colour. In that case, Nielsen says you’ll need to apply a product like Messmer’s UV Plus for Hardwood Decks every spring to maintain the rich, nutty tones of new wood. Hands down the best decking material available is the Brazilian hardwood ipe. One of the hardest woods available, ipe resists fire, just as concrete and steel do, and is impervious to pests, rot, UV damage and mould. Ipe decks are Hofmann’s specialty; he has seen other materials fail time and time again and now uses ipe exclusively. If you are happy with the silver patina of naturally aged ipe, maintenance is easy; simply power wash annually. Or oil the wood every year to maintain ipe’s olive-brown glow. The downside? It’s more expensive to buy and more labour intensive to install because it’s literally as tough as nails. But ipe’s longevity is sure to save you money in the long run. Whether you prefer a square, clean-lined European esthetic aged to a silvery patina, or the rich tones of new wood on a surface with plenty of curves, a carefully crafted deck will add valuable living space to your home, and provide a bridge between house and yard. Designed expertly and built with the best materials for our climate, your new deck should be the very last you ever build.